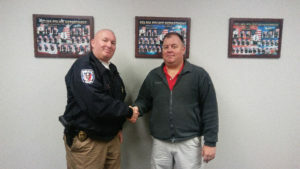 Selma Police Chief Billy Thomas has promoted Sergeant Jamie Hughes to the rank of Captain. Hughes will oversee the investigations division. He fills the position formerly held by Captain Ronald Daniels who retired on January 31st. Hughes grew up in the Brogden community and graduated in 1994 from Princeton High School. He worked as a welder in his family business for several years before enrolling in Basic Law Enforcement training. Upon graduation in 1999 he worked the next 2-1/2 years at the Johnston County Sheriff’s Office. In 2001, he joined the Selma Police Department. Hughes started with Selma Police as a patrol officer. He was promoted to sergeant in 2005 and in 2012 was promoted to the investigations division. This Friday, February 8th, will mark Hughes 20th anniversary as a law enforcement officer. Captain Hughes lives in the Selma area with his wife and two children. While not on duty, he enjoys spending time with his family, hunting and fishing.